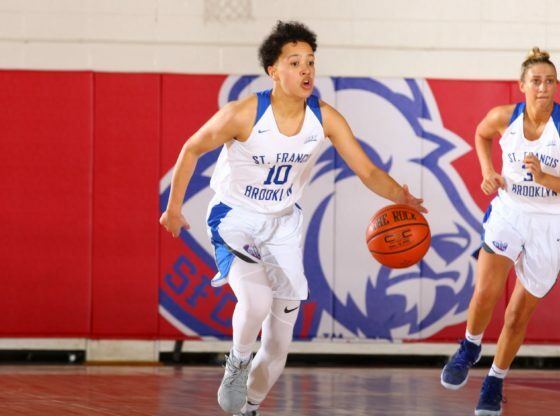 On a day honoring SFC legend Karen Erving-Schiera, the St. Francis women’s basketball team (13-9, 7-3 NEC) were victorious defeating Fairleigh Dickinson University (6-15, 3-7 NEC) in a final score of 73-61. This win will keep the Terriers in second place in the Northeast Conference being tied with Sacred Heart University and Saint Francis (PA). Following her first career triple-double game last Saturday against Sacred Heart , Amy O’Neill continued to show her presence on the court finishing with almost yet another triple-double (10 points, 11 assists, and 7 rebounds) in today’s game. Grad Student Dominique Ward and Sophomore Ally Lassen were the two leading scorers for St. Francis as Lassen finished with 17 points and 4 assists while Ward ended with 15 points and 7 rebounds. Both Lassen and Ward were able to score the final 10 points in the game to give the Terriers the victory at home. With this win secured for St. Francis, they will go back to play on the road as they face Wagner College on Monday February 11, 2019 at 7:00 pm.